Students and faculty want more space for walking and biking by LaGuardia Community College, but DOT says Thomson Avenue has to accommodate bridge traffic. On Tuesday, DOT presented an update on its plans for Thomson Avenue by LaGuardia Community College to a room full of students and faculty. They weren’t impressed. Like the design DOT showed last year, the revised plan fails to meaningfully reallocate space from motor vehicles to provide safe walking and biking conditions on a street with several schools [PDF]. Thomson Avenue between Van Dam Street and Skillman Avenue is highway-like, with three lanes for motor vehicles in each direction. Compounding the dangers, motorists making the transition from the Queensboro Bridge’s upper level pour onto Thomson Avenue, with little to slow them down as they enter a bustling pedestrian environment. Sidewalks are crowded at the busiest times of the day, and pedestrians are often forced to walk in the roadbed, say LaGuardia students and faculty. In 2013, an eastbound motorist plowed over a curb and killed 16-year-old Tenzin Drudak, a student at nearby Applied Communications High School. From 2012 to 2016, two people were killed and another 11 severely injured on that stretch. Despite the inadequate space for pedestrians and the glaring dangers posed by speeding drivers, DOT told attendees on Tuesday that the motor vehicle lanes have to accommodate bridge traffic and can’t be narrowed. 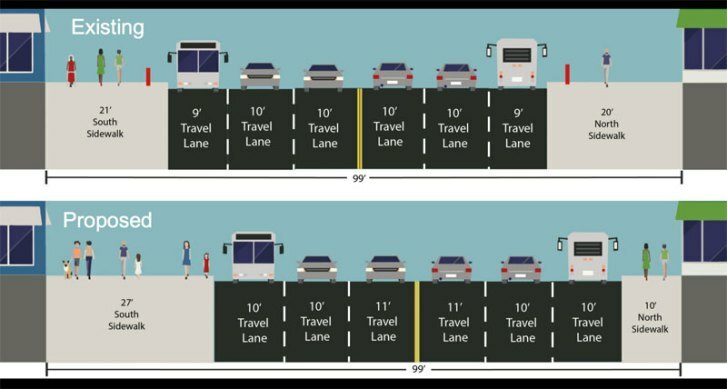 Last year, DOT proposed adding six feet to the crowded southern sidewalk — at the expense of 10 feet on the northern sidewalk [PDF]. The design retained three travel lanes in each direction. Unsatisfied, LaGuardia President Gail Mellow called on the agency to come up with a design that does more for walking and biking. The updated DOT plan does little to address Mellow’s concerns. The agency has scrapped the sidewalk width modifications, continuing to tinker at the margins without adding significant protections for walking or biking. Instead, the agency says it will merely study minor improvements, like adding a mid-block crossing in front of LaGuardia’s “E” Building and adding a parking lane on the north curb. LaGuardia student Anthony Tellez lives in Elmhurst, right by Queens Boulevard’s new protected bike lanes. The bike lane is “really nice,” Tellez said, but it terminates at 49th Street — one mile east of the school. Tellez was among the students who testified in favor of safe cycling infrastructure at Tuesday’s meeting. “There’s no safe bike lanes on Queens Boulevard heading towards LaGuardia,” Tellez said. His friends who do bike to school, mostly from Brooklyn, have to contend with “maniacs” driving on Thomson Avenue. “That kind of discourages me from riding a bike to school,” he said. The most significant upgrade in the new plan is at the intersection of Thomson Avenue, Van Dam Street, and Queens Boulevard. DOT will be adding crosswalks at this complex, multi-leg intersection with a heavy car traffic making a multitude of turning movements. 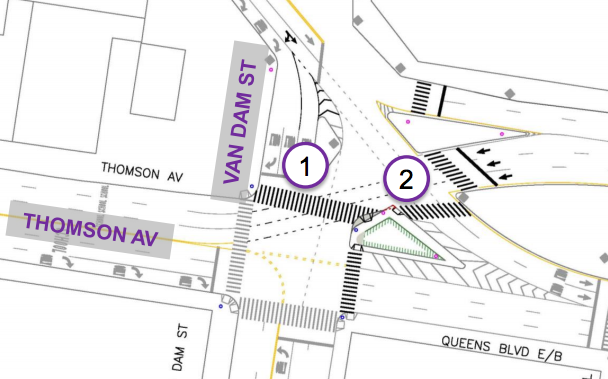 LaGuardia students, however, say the intersection will remain treacherous because DOT wants to retain a blinking yellow light for eastbound motorists turning south from Thomson onto Van Dam, which runs simultaneously with the walk signal. There’s rarely a gap in the constant stream of turning buses and trucks when pedestrians can cross. More evidence that with Trottenberg & DeBlasio, when push comes to shove, moving cars is still the #1 priority. The thing I just don’t get is that there’s only 2 lanes on the Bridge Approach to the Upper Level. But Thomson has 6. Wouldn’t keeping the number of lanes consistent actually make traffic flow better. That would open up space for expanded sidewalks and Protected Bike Lanes. Why do they need so many lanes west of Van Dam St? Would like ripe for some best practice traffic calming there. Maybe one travel lane each direction, a bus lane and significant narrowing. I’ve come to think Trottenberg would do a lot more if de Blasio wasn’t in her way.